Northwestern’s Kellogg School of Management announced today that women will make up 46 percent of the incoming two-year, full-time MBA Class of 2020. That’s a four-percentage point jump over last year and a record high for the school. U.S. minorities are also up—comprising 27 percent of this year’s first-year students, as compared to 25 percent last year. Meanwhile, average GMAT (432) and GPA (3.6) were identical to last year. Class size also remained constant at 478. 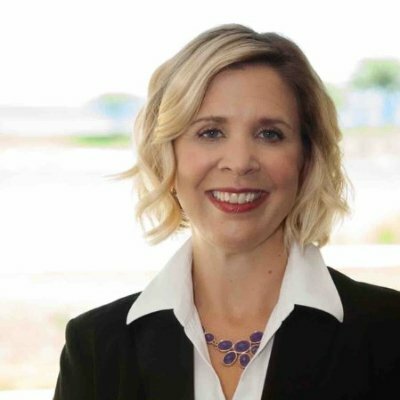 “I am very, very thrilled with the diversity of the class,” Melissa Rapp, Kellogg director of admissions for full-time MBA and MSMS programs, told Clear Admit. “And not just because of the percentages but also the quality of candidates across the board,” she said. International students will make up 34 percent of the incoming class, drawn from 46 countries around the globe, a modest one-percentage point decline amid soft overall international applicant volume to U.S. schools. Rapp pledged that she and her team will keep striving to attract the most diverse classes possible. “I firmly believe that diversity in the classroom leads to better learning and a more impactful experience for every student who is here,” she said. For the past six years Kellogg’s average GMAT score has been on the rise, climbing from 708 in 2012 to 732 last year. Rapp said she is not at all concerned to have it remain static at 732 this year. “That our average GMAT and GPA have stayed the same shows that we continue to attract a really outstanding pool of applicants year after year,” she said. Average undergraduate GPA also didn’t budge—coming in at 3.6 for now the third year running. As for what applicants studied while in college, 50 percent of this year’s incoming class majored in business or economics, up from 49 percent last year and 45 percent the year before that. STEM majors fell slightly to 29 percent, down from 30 percent the year before. Humanities majors both this year and last made up the remaining 26 percent. 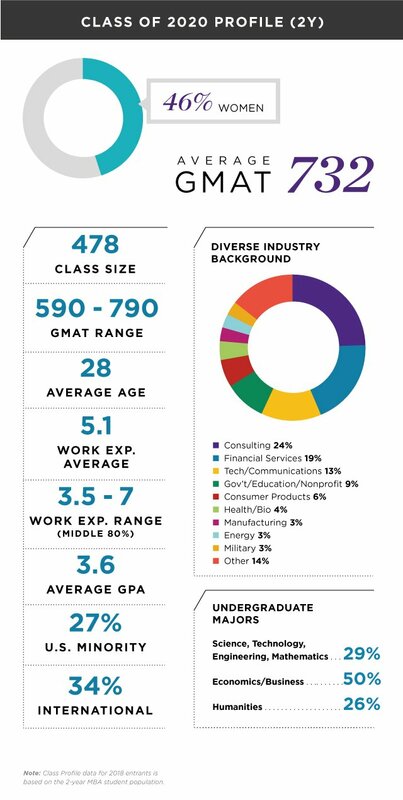 In terms of pre-MBA work experience, approximately one in four incoming Kellogg students—24 percent—come from consulting, down from 27 percent last year. Another 19 percent come from the financial services industry, also a slight decrease from last year’s 20 percent. Up this year? Students who have worked in tech/communications grew from 12 to 13 percent. “I think the changes that we see in our class really reflect the changes that we see in the business world,” Rapp said. “There are more people from tech, which is not surprising for anyone since there is more tech in the world than there ever has been.” Students with government/education/nonprofit experience also increased, from 7 to 9 percent. By far the biggest news today is that Kellogg has come closer than ever before to gender parity with its newest incoming class. USC Marshall School of Business made headlines last month by becoming the first leading business school to cross the 50/50 mark—women will make up 52 percent of the Marshall Class of 2020, a staggering 20-percentage-point jump over last year. At UT Austin’s McCombs School, which has also shared a preliminary Class of 2020 profile, the percentage of women slipped year over year, from 40 to 38 percent. And at Cornell’s Johnson Graduate School of Management, which welcomed it new Class of 2020 students to campus last week, women make up 33 percent, a five-point gain over last year. “It’s really pretty exciting,” said Rapp of Kellogg’s 46 percent women. She credits the gains in female enrollment in part to the vision and leadership of outgoing Kellogg Dean Sally Blount, who served as dean from 2010 until she stepped this past spring. Kellogg has also called on its current female students, including members of the Kellogg’s student-led Women’s Business Association (WBA), to take part in admissions outreach activities in hopes that they can forge meaningful connections with prospective female candidates early in their exploration process. New this year, the school also convened its inaugural Global Women’s Summit in May. More than 1,200 women participated “live”—with 800 at Kellogg’s Global Hub in Evanston and the rest via extension events in London, Hong Kong, New York, Boston, San Francisco, Miami, Seattle, and Chicago hosted by companies including Amazon, Microsoft, and Starbucks. Over the course of the two-day event, the #KelloggWomen hashtag was trending in Chicago and generated 2.7 million overall impressions. “The breadth of engagement the summit allowed for provided a really nice bridge from prospectives to current students to our alumnae population,” Rapp said. Kellogg also this year hosted its third-annual Women’s Leadership Seminar, a unique five-week lineup for second-year MBA students combining lectures, workshops, networking events, and alumni panels on recruiting issues women face. “The goal is to ensure that our high-potential women are equipped to pursue and navigate careers that have deep personal and professional meaning,” Rapp said. Those Kellogg women, it seems, have been doing a good job of helping prospective female applicants see Kellogg as a place they want to be, too.